Are you looking for something fun to do with your kids? Do you want to make special keepsakes and one-of-a-kind projects together as a family? 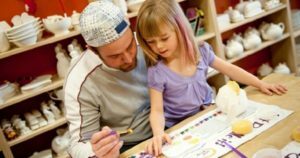 Bring your kids into Crock A Doodle Paint your own Pottery for some hands-on family fun Unionville Markham. Together you can paint and play to create your own hand-painted pottery pieces – one-of-a-kind art you can use and cherish for years to come. Enjoy some colourful family fun on rainy days…or any days! Paint without the kids– join us for a Ladies Night or Project class – enjoy a creative escape! Come in to create with Crock A Doodle. Enjoy some special together-time as a family. Contact us for details.